I had the privilege of hearing Taggart Murphy speak a few weeks ago at our Rotary Club of Bangkok South luncheon meeting. Murphy is an engaging and genuinely interesting speaker, and I was very interested to hear his thoughts on Japanese politics, economics, and culture. His presentation inspired me to purchase his recent book “Japan and the Shackles of the Past”, which was published in December 2014 by Oxford University Press. Murphy is a Professor of International Political Economy at the MBA Program in International Business at the Tokyo campus of the University of Tsukuba. He is also a former Investment Banker, and was a Non-Resident Senior Visiting Fellow at the Brookings Institution. “Japan and the Shackles of the Past” is very well researched and presented, and is organized into two parts. Part One is titled “The Forging of the Shackles” and presents a very thorough political, economic, and cultural history of Japan. Murphy diligently educates the reader in the historical and cultural foundations upon which Japanese society has been constructed. Murphy has very thoroughly researched and presented both the rich historical background and the complex, opaque, and frequently contradictory nature of modern day Japanese culture and politics. The final chapter of the book “Japan and the World” primarily deals with Japan’s current events and geopolitical challenges and strategy starting in mid 2010. With out a doubt, this is by far the most interesting and thought provoking chapter in the book. Murphy skillfully analyzes, interprets, and anticipates Japan’s current events and strategy by frequently referencing the foundational material presented in the previous 10 chapters. It is clear in the final chapter that Murphy has shifted his author’s perspective from cultural and economic historian to geopolitical and economic analyst and strategist. He objectively explains current events, and then presents his subjective analysis of these events based on his extensive knowledge of Japanese history and culture. 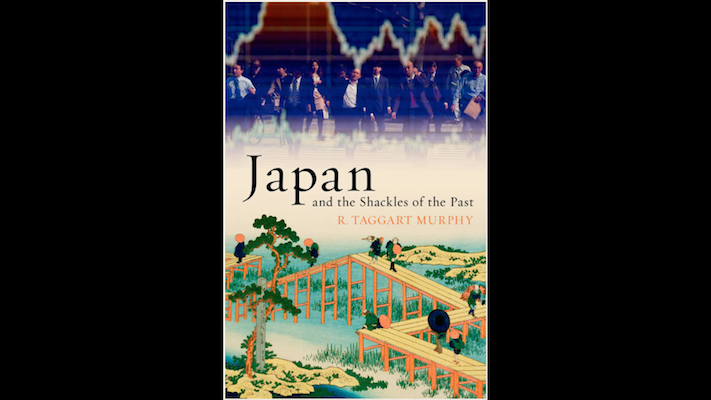 I highly recommend reading Taggart Murphy’s “Japan and the Shackles of the Past”. It is a great compliment to my other two recent recommendations, “Asian Godfathers” and “How Asia Works”, both by Joe Studwell.